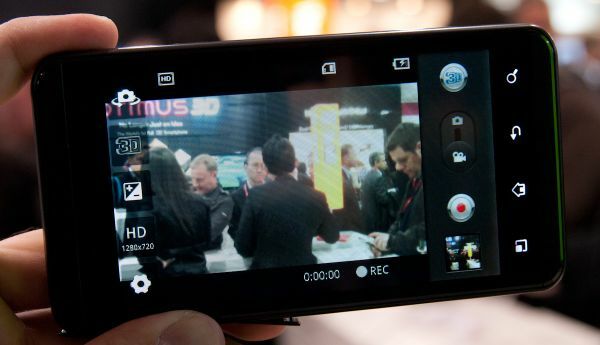 We covered the LG Optimus 3D during its launch event yesterday, and the device has continued to draw our attention. 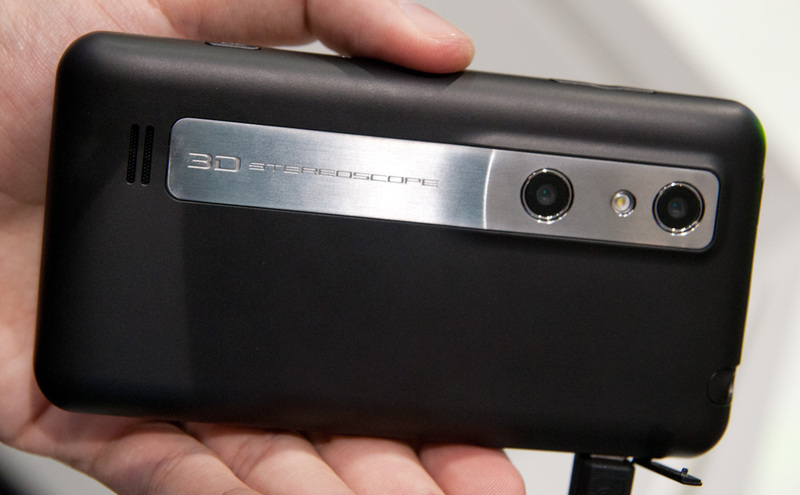 Today we decided to track down an LG Optimus 3D to get a better impression of its 3D capture and playback capabilities, and to run some benchmarks. The Optimus 3D features (surprise) a 3D autostereoscopic display from LG. Both the IPS panel underneath, and the parallax barrier on top are LG's own. Most of the Android UI is of course 2D - the parallax barrier can be switched on and off or varied in intensity depending on the context. We got some time to check out the 3D capable YouTube application. It's not an extra or an add-on, but rather Google's own real official YouTube application. It just happens to have 3D support included. 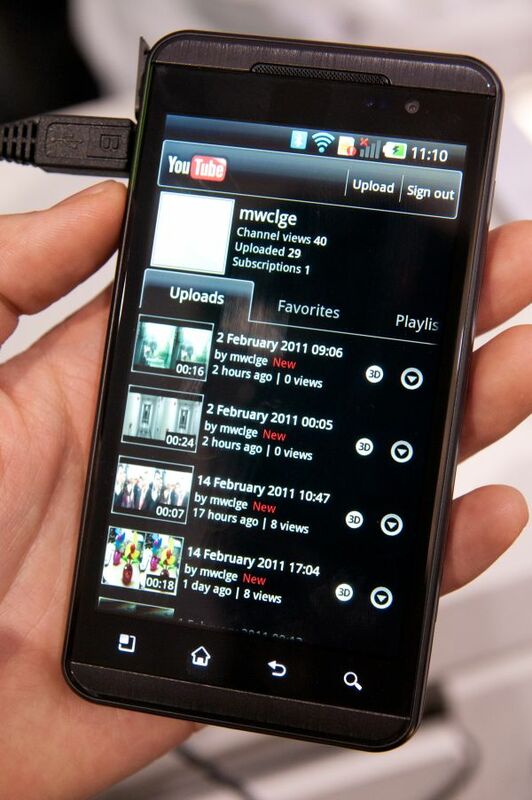 Right now that YouTube version is exclusive to the LG Optimus 3D, but it'll eventually move into the market and onto other phones as they too get 3D capture and playback support. YouTube puts a 3D icon next to videos that support 3D and will play them back on the Optimus 3D in landscape with the parallax barrier enabled. Our impressions of the parallax barrier display are relatively positive. Depth isn't too overwhelming at most settings, and can be changed in most 3D contexts by dragging a slider. When viewing the display, it's obvious that there are a set of optimal viewing angles for the parallax barrier. It's difficult to describe how the 3D effect looks from different angles - as you change your viewing angle across the display, the 3D effect comes and goes accordingly. It definitely requires some thought to position oneself appropriately. 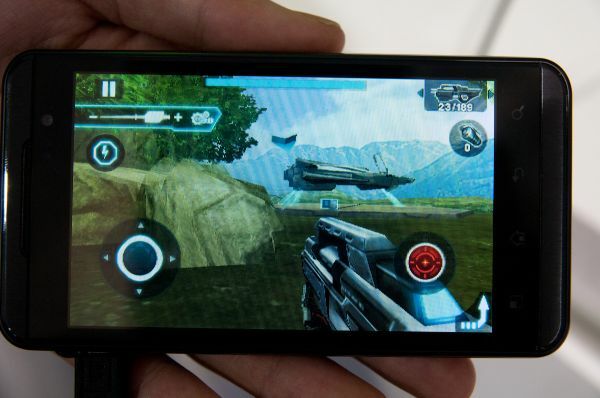 LG also worked with Gameloft on a number of titles, including N.O.V.A. 3D. We got to play around and were decently impressed. LG spent a lot of time going over which scenes should have negative or positive parallax, and includes a depth slider for intensity. Other 3D games also include depth sliders and even allow 3D to be disabled entirely. There are a bunch of other uses for 3D that LG is working on with, including more close work with Google in other applications. 3D video capture is supported in the native camera application. The interface is exactly the same as the one on the LG Optimus 2X, instead there's a 3D button. Press that, and the parallax barrier fires up, and you get a live 3D preview. Other than that, we've had a busy couple of days of benchmarking at Mobile World Congress. Yesterday we spent a lot of time with Samsung's recently announced Galaxy S II, featuring Samsung's Exynos SoC. The Exynos is Samsung's own dual-core Cortex A9 with an ARM Mali 400MP GPU. 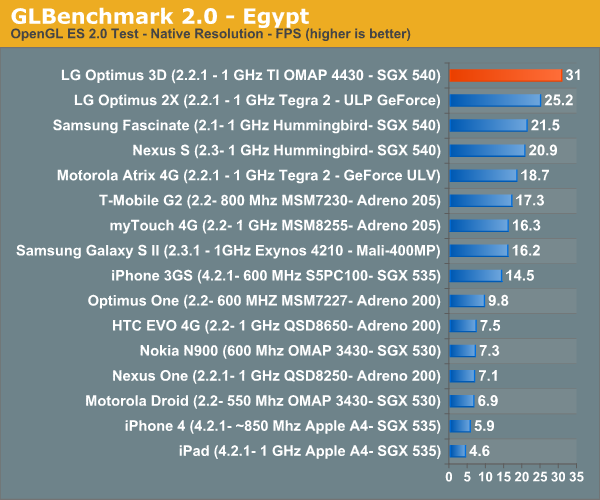 We measured competitive CPU performance from the Exynos in the Galaxy S II, however the GPU performance was a bit behind the Tegra 2. 2) TI has a dual-channel LPDDR2 memory controller (Tegra 2 only has a single-channel memory controller). 3) The OMAP 4430 integrates Imagination Technologies' PowerVR SGX 540 running at ~300MHz, NVIDIA uses its own GeForce GPU. I don't expect there to be a measurable performance advantage today due to MPE as I'm not aware of any substantial (or any?) NEON code in the apps we test with. The dual-channel memory controller and higher clocked SGX 540 are another matter entirely. Taking the performance improvement due to the driver out of the equation, we're still looking at a nearly 20% increase in performance over the SGX 540 in Hummingbird. 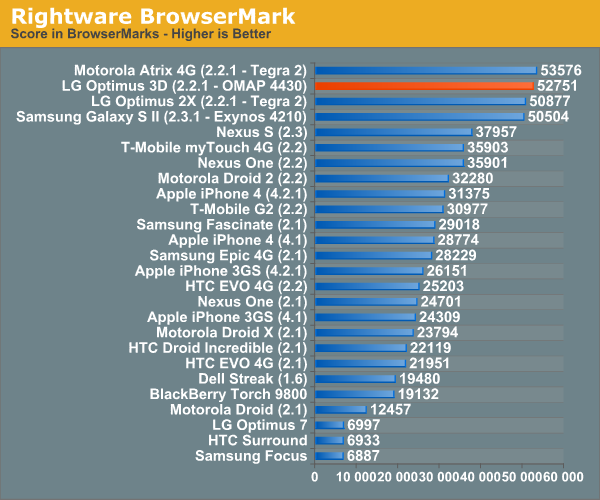 The 4430 holds a similar advantage over NVIDIA's Tegra 2. It's sort of nice to have so many different SoCs available at the same time. 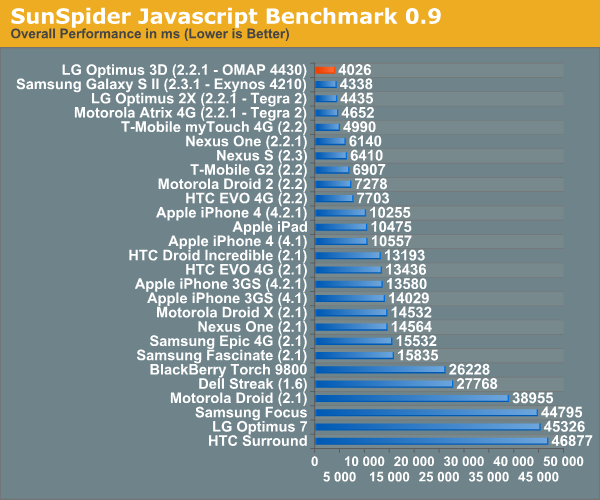 TI's OMAP 4430, Samsung's Exynos 4210, NVIDIA's Tegra 2 AP20H and Qualcomm's upcoming MSM8660. Right now it looks like the OMAP 4430 may be the best performer out of them all, however it remains to be seen what Qualcomm's Adreno 220 will bring to the table when the MSM8660 ships later this year. "Most PowerVR SGX 540 designs run the GPU core at up to 200MHz. 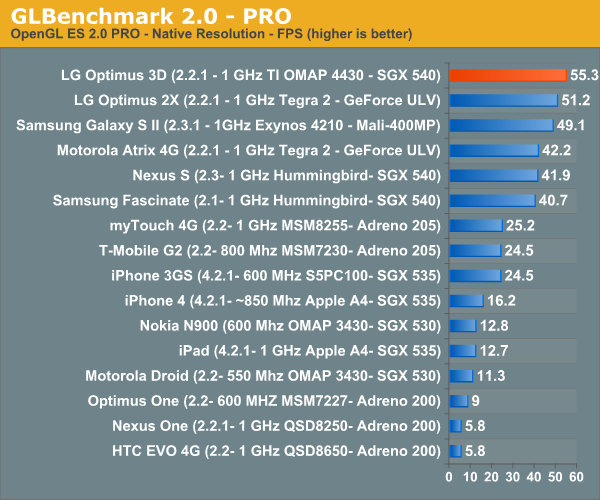 Exynos' implementation is another 50% faster. LG's software build also uses a newer version of Imagination Technologies' driver (1.6 instead of 1.5) which fixes some rendering issues and improves performance considerably (likely between 10 - 30% in GLBenchmark2)." OOps, OMAP4 is what's meant. Indeed, both are parallax barrier autostereoscopic 3D displays and operate very similarly.